Have you prepared your landscape for the winter. If not, then check out our Winter Lawn and Garden Tips. Trim Shrubs, Hedges, and Trees: The dormant months are ideal for pruning and trimming perennial plants. In addition to these plants, the vast majority of shrubs and hedges can be pruned during this time. If you’re thinking about pruning your trees, now is also a great time to prune both evergreen and deciduous trees. To properly prune your trees, inspect the tree thoroughly and cut back only failing or decayed branches. Unless you are absolutely confident in your tree pruning capabilities, we recommend consulting a local, reliable, insured tree removal service. Have them remove any dead trees or high branches prior to winter. Winter storms can bring high winds and heavy snow, which can turn dead limbs into falling hazards. Remove Leaves and Debris: Throughout fall and into winter, it is very important to keep leaves off your lawn every few days. Leaves and debris that sit on the surface of your lawn prevent sunlight from reaching the grass blades underneath. Less sun means less growth, which in turn makes your grass look less lush and healthy. It can also result in a spotty looking lawn, with patches of dead or brown-looking grass. Prepare Beds for Mulch: As spring approaches, get a head start on your planting beds in four easy steps. First, prune all shrubs, trees and perennials in your planting beds. 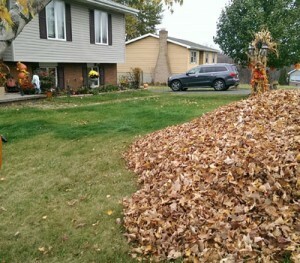 Then, remove all leaves and other debris. After your beds are clear, define the edges of the planting beds by first hard edging, followed by a perimeter pass with a lawn mower along the edge, followed by line trimming for a clean, crisp finish. Finally, install your bulbs for spring. For ideal results, the bulbs should be planted in a well-draining, elevated planting bed. Mulch Planting Beds: Mulch your planting beds at a depth of 1.5 – 2 inches. Mulch is not only aesthetic but also acts as a shield against harsh winter weather. Having over 1.5 inches of mulch keeps the roots of your plants warm and protected. As you mulch, be certain not to cover the trunk of any shrub or tree trunks. Mulch holds moisture and can cause trunk and root rot if it is spread too heavily around the base of plantings. For a finished look, contour the mulch by patting it down with the back of a pitchfork or rake. Mow the Lawn: In late fall, mow your lawn one last time to prevent matting under winter snow. Get Ready for the Snow: Tie up your loosely branched evergreens and boxwoods to prevent snow damage. Do not use a broom or snow shovel to knock the snow off shrubs, as the limbs may be frozen and extremely fragile. Even the lightest poke at a shrub in such weather can result in substantial damage. Prepare Water Faucets: You should also make sure that all your water systems are properly winterized, including irrigation systems. Make certain all water spigots are turned off and covered. If you have leftover organic chemicals, store them away for winter in a place they cannot freeze.